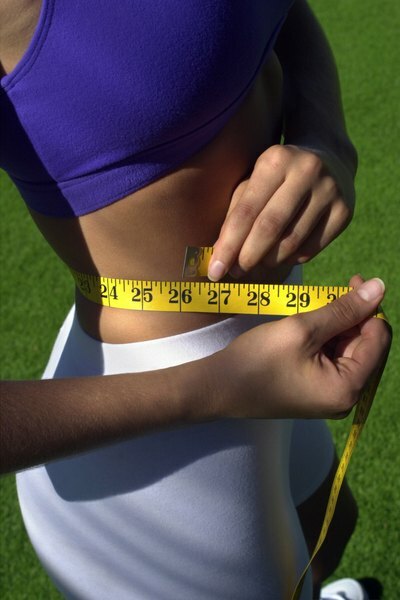 Tone your waist and hips for that feminine figure you desire. The hourglass figure has been immortalized on film and in marble. On and off throughout the centuries, this has been the ideal figure to which women have aspired: a narrow waist broadening to fuller hips. If sporting a feminine figure and hips is your goal, then performing these exercises for your waist and hips will get you off to a good start. Be realistic, though. Your genes have a lot to do with your basic shape and to feel really good about yourself, you have to work with your natural body type. Stand with your feet three feet apart and pointing forward. Bend your knees slightly and keep them loose throughout this exercise. Raise your arms straight out from your sides to shoulder height, with the palms of your hands facing down. Twist your upper torso to the right, starting the move from your waist. Turn your head to the right at the same time to look over your right shoulder. Repeat the move to the left and then speed it up. For up to two minutes, twist from right to left at a fast pace, keeping your knees springy. You can keep your eyes open or closed depending on which feels better to you. Breathe naturally. Stand on a non-slip surface. Bend forward from your waist and place your hands on the floor to the inside of your right foot. As you step back with the left leg, bend your right knee until your right upper thigh is parallel to the floor and your right knee is stacked directly over your right ankle. Stretch your left leg straight behind you and turn your left toes under. Take three to five breaths and then drop your left knee to the floor. Breathe three to five times, lift your left knee off the floor and then raise your hips toward the ceiling as you straighten your right leg. Move your right hand to the outside of your right foot. Take up to five breaths and then drop your left knee back to the floor as you bend your right knee and move your right hand back to the inside of your right foot. After three to five breaths, lift your left knee off the floor and straighten your left leg, staying in that position for up to five breaths. Repeat the whole lunge sequence on the other side. Stand with your feet hip-width apart and your hands on your hips. Raise your left leg as high as it will go without strain and cross it in front of the right leg while keeping your hips square to the front. Return your left leg to the starting position. Raise your right leg and cross it over your left leg. Speed it up and continue lifting and lowering each leg to the right and left for up to one minute or longer. Breathe naturally. If, at first, you have trouble placing the palms of your hands on the floor in the Lunge sequence, it's acceptable to use your fingertips, as most of your weight will be borne by your legs. You may also rest each hand on a yoga block or a couple of stacked books until you become flexible enough to reach your hands to the floor without strain.